Share a love of dance with the community. Increase people’s awareness of and appreciation for creative and expressive dance. Dance amongst a group of friends who respect and admire each other’s unique ways of moving. 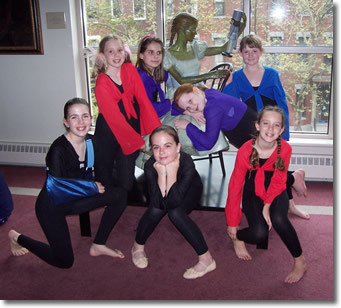 Dedicated students, ages 8 to 18, with at least two years of dance experience or by the invitation of the instructor are welcome to be a part of the Dancers’ Workshop. As a member dancers have the chance to learn pieces of choreography in a variety of dance styles as well as perform their own original works. The focus is on team work and performance. Dancers must be focused, disciplined, able to take directions and learn steps, and be able to work with a group of people. They must also have an understanding of the hard work involved in preparing for a performance and have a love of dance and performing. Being a member is a large commitment, but also a wonderful and rewarding experience. Because of the nature of The Dancers Workshop, dancers must commit to being a part of the company for the entire year. Dancers attend rehearsals once a week with additional rehearsals scheduled near performance dates if necessary. In addition to attending workshop rehearsals, students are required to attend at least one other dance technique/choreography class at their appropriate age level. Perfect attendance is mandatory for members. Rehearsals are like putting together a jigsaw puzzle – if one piece is missing, it is much more difficult to assemble the others and the picture is different. Therefore, to ensure a positive feeling of support and community within the group, students who miss more than 1-2 rehearsals in a session will be given an appropriately simplified part in the production. Membership fees are divided into two payments due the beginning of September and again in November. Other payment plans may be arranged if needed. Fees include all rehearsal and performing costs. Costumes, other than leotards and tights/dance pants, will be provided and will remain the property of the Creative Dance Center.